The use of wearable fitness tracking devices is rapidly increasing. 12% of U.S. consumers own a fitness band or smart watch; 9% of those owning fitness bands. From 2014 to the first quarter of 2016, Fitbit alone sold 36.7 million trackers! What is this craze all about? 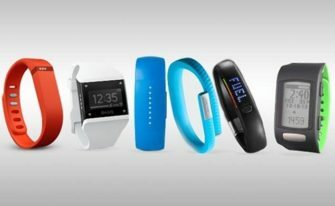 A fitness tracker is a wearable device or a computer application that records a person’s daily physical activity, along with other data relating to fitness or health, such as the number of calories burned, heart rate, etc. Fitness trackers also measure a number of things other than the well-known “steps.” Other measurements conducted by fitness trackers include pulse, heart rate variability, blood oxygenation, body temperature, blood sugar, and sleep. There are many benefits of fitness trackers, which might help to explain the 12% of Americans using them. Fitness trackers help maintain accountability by tracking goals as well as progress. For those who enjoy working out alone, and maybe even are uncomfortable in a gym, fitness trackers provide support wherever you are. Overall, fitness trackers provide you with a great deal of knowledge in regards to your activity level and overall health. They even send you friendly reminders to get moving when you’ve been stationary for a certain period of time. Seems easily convincing, right? There are some reported downfalls to fitness trackers. There is a chance of inaccuracy in the devices when counting steps, calorie burn, and even heart rate at times. Studies have been conducted where individuals wearing different types of devices at the same time actually receive a different number of steps from each devices. Another downfall is that some forms of exercise are immeasurable, such as skiing/snowboarding. The last major negative is the potential for becoming obsessive over fitness tracking, taking the fun and enjoyment out of exercising.